The brown recluse may be small, but it's scary nonetheless. The spider is a well-known safety risk in the United States due to its potent poison and a large native range that extends through many U.S. states. The common house spider (Achaearanea tepidariorum) is one of several species frequently mistaken for recluses. Like the black widow spider, poison dart frog and other venomous creatures, brown recluses possess distinctive markings that emphasize their deadly potential to warn away would-be predators. In the recluse's case, this marking is a violin-shaped patch of dark pigmentation on the top of the head immediately behind the eyes. The recluse's body is brown, but the violin marking is notably darker than the surrounding tissue. In contrast, the house spider does not possess such distinct markings. While the two spiders have a similar body color, the house spider's markings appear as flecks or an amorphous dark patch of pigment. House spiders also have dark rings on their eight limbs, while recluses maintain uniform coloring, according to NC State University Cooperative Extension. One of the biggest differences between the brown recluse and house spider is their preferred locations for web-building. House spiders create theridiid webs, which are three-dimensional structures rather than flat nets, in elevated locations. Brown recluses stay true to their name and tend to construct their webs in secluded spots behind and beneath larger objects. They are often found under appliances and furniture in basements, inside woodpiles and in other sheltered areas. The chances of walking through a brown recluse web are slim. House spider webs are highly visible and often make up some of the mass of lingering "cob webs" along the ceilings of your home and garage. Along with their characteristic body marking, brown recluses are also easy to identify by their unusual eye placement. 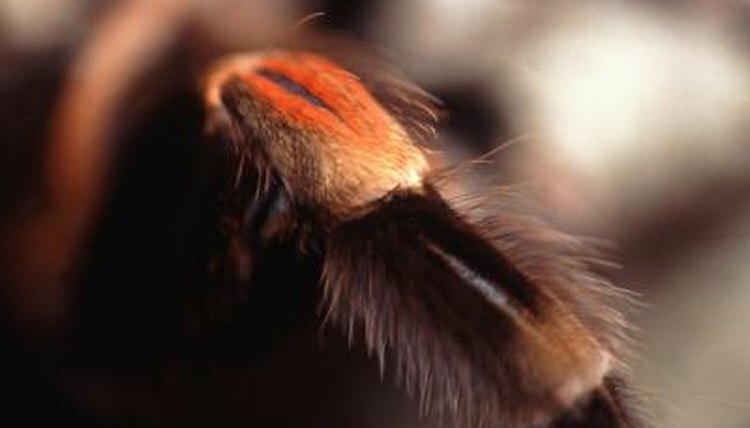 While most spiders rely on eight eyes positioned in two rows towards the front of their head, brown recluses have three separate pairs of eyes spaced apart to give them a wide field of vision, according to NC State University Extension. For humans, one of the most significant differences between the recluse and house spider is the amount of danger they pose. While isolated cases of fatal reaction to house spider bites have been recorded, they are not considered a significant health hazard for humans, according to University of Florida IFAS Extension. Brown recluse bites are much more dangerous. While the vast majority of brown recluse bites don't lead to significant harm for the victim, some cases have become life-threatening, especially in children, the elderly and those with weak immune systems. Bites not always immediately painful, although a negative response by the victim's body is evident in noticeable skin damage around the wound. The bitten area may become itchy or irritated before painful skin damage develops from exposure to the venom.